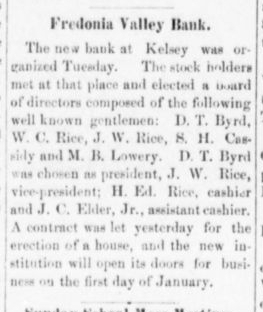 The new bank at Kelsey was organized Tuesday. The stock holders met at that place and elected a board of directors composed of the following well-known gentlemen: D. T. Byrd, W. C. Rice, J. W. Rice, S. H. Cassidy and M. B. Lowery. D. T. Byrd was chosen as president, J. W. Rice, vice-president; H. Ed. Rice, cashier and J. C. Elder, Jr., assistant cashier. A contract was let yesterday for the erection of a house, and the new institution will open its doors for business on the first day of January. Source: Crittenden Press. (Marion, Ky.) 1879-1907, November 15, 1894, Image 3 - Chronicling America - The Library of Congress.